This is very tasty and simple to make, especially because all the prep work is done ahead of time. Don’t worry if it looks as if there’s very little egg compared to the veggies, cheese and bread: it all bakes up nicely. One note: I substituted a few shallots for the onions in the recipe below. Heat oil in a nonstick skillet over medium-high heat. Add zucchini, mushrooms, bell pepper, onion, and garlic, and sauté vegetable mixture 6 minutes or until tender. Remove from heat. Stir in artichokes, and set aside. Arrange Italian bread cubes in a 13 x 9-inch baking dish coated with cooking spray. Spoon zucchini mixture evenly over bread cubes, and sprinkle mixture with cheeses. Combine egg substitute and remaining ingredients (except oregano sprigs) in a large bowl; stir with a whisk. Pour egg mixture over zucchini mixture. Cover mixture with foil; chill up to 1 day. 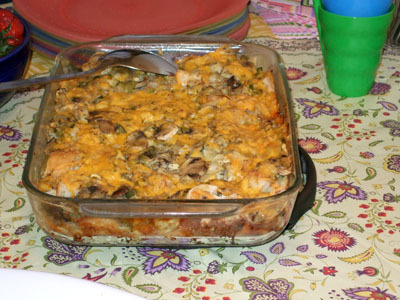 Preheat oven to 325-degrees F. Bake strata, covered, 1 hour or until bubbly. Garnish with oregano sprigs, if desired.